Bare root shrubs are a great value way to introduce beautiful shrubs to your garden during winter, and this collection combines 10 of our favourite varieties. 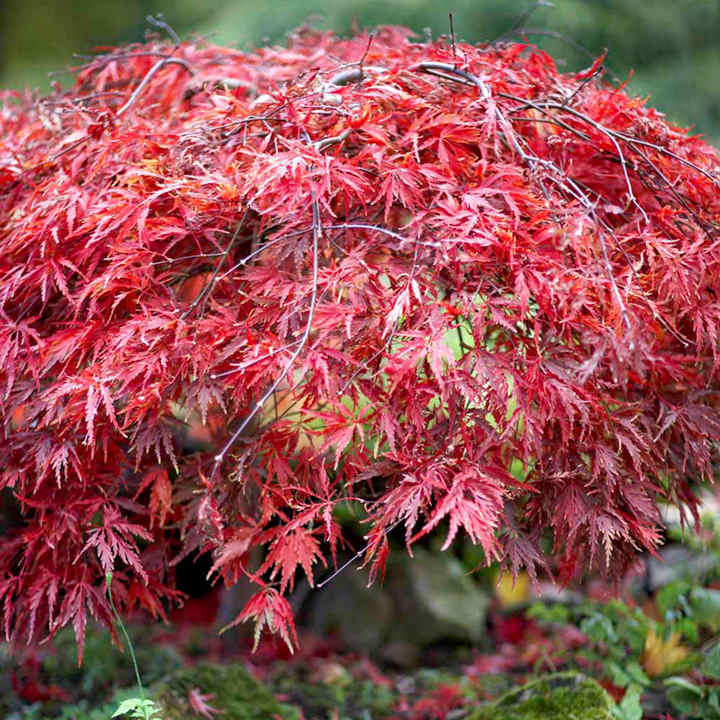 You’ll receive 10 varieties including acer palmatum, berberis, cornus, deutzia, forsythia, mahonia, philadelphus, potentilla, ribes, weigela, filling your beds and borders with an assortment of colour and form for every season. 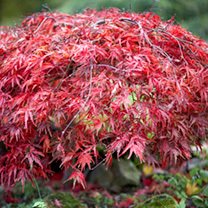 Acer Palmatum / Japanese Maple – A beautiful specimen plant with lovely palmate shaped foliage. Great for adding a touch of the exotic to a garden or patio container. Great Autumn colour too. 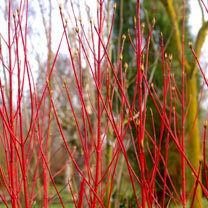 Cornus Alba / red-stemmed dogwood - Bright red stems are a real highlight during the winter when there is little colour in a garden. Also looks fantastic during the spring and summer with fresh green foliage. Deutzia Scabra - This great large growing shrub will get covered with white flowers in the summer and be a real eye catcher at the back of a border. Forsythia Intermedia / Golden Bells - The golden yellow flowers which clothe this beauty are a real sign of spring and warmer weather approaching. 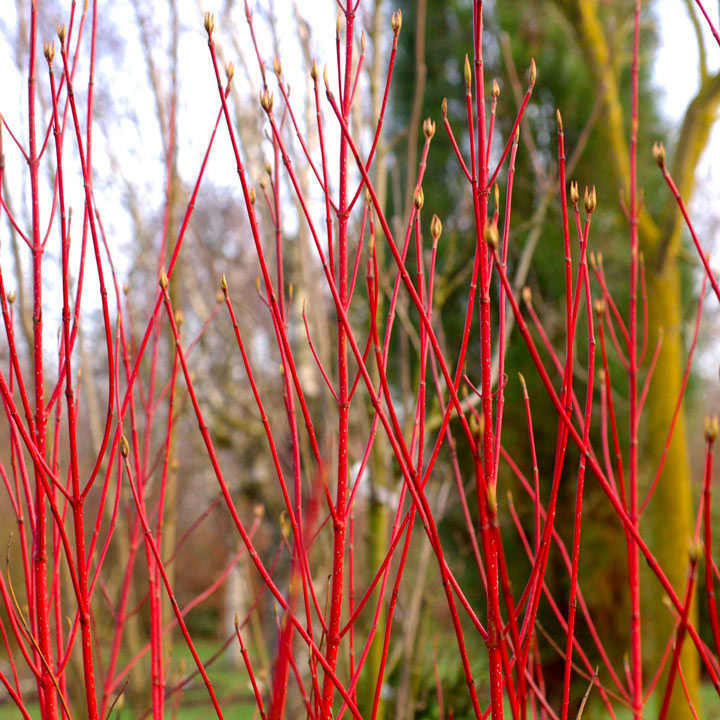 True spring colours to brighten up any garden. Mahonia Aquifolium / Oregon Grape - This tough evergreen is attractive all year round with dark green slightly prickly foliage setting off bright yellow flowers early in Spring. An early bloomer. 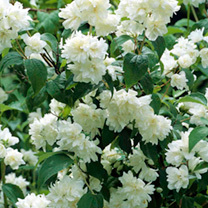 Philadelphus Virginal / Mock Orange - A great shrub that offers everything! The highly fragrant flowers are pure white in colour, double headed and produced in large numbers for a stunning display. Potentilla Fruticosa / Yellow Cinquefoil - This compact shrub produces an abundance of gorgeous yellow flowers and is particularly suited to the front to middle of a border. Ribes Sanguineum / Flowering Currant - Lovely elegant pink red flowers smother this this ornamental flowering currant from as early as April while a lot of the rest of the garden is just starting to grow. 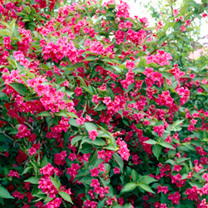 Weigela Bristol Ruby - A great early summer flowering shrub which gets covered with deep red trumpet shaped flowers producing a very colourful display. Ideal for beds and borders. Scented. Attractive to butterflies and bees. Grows well in sun or shade. Great contrast to summer bulbs.